But today I am compelled to write about a different sector of workers you might not know or think about. My goal is to introduce you to the independent service industry in Cairo. To honor these entrepreneurs and their critical importance to keeping this urban society running. A broad-shouldered man in a brown suit sits alone in the cafe in the Cairo train station, enjoying a Turkish coffee and reading a local paper. Another man, more casually dressed, approaches him. With little words, a negotiation is made. The more casual bends down and takes off the seated man’s shoes, slipping a piece of cardboard under his now stocking feet. He takes the shoes away while the man continues to enjoy his coffee and paper. In just a few minutes, he returns, delivering the shined shoes on another piece of cardboard, like a platter. He puts the shoes back on the other man’s feet, collects his money, and away he goes. 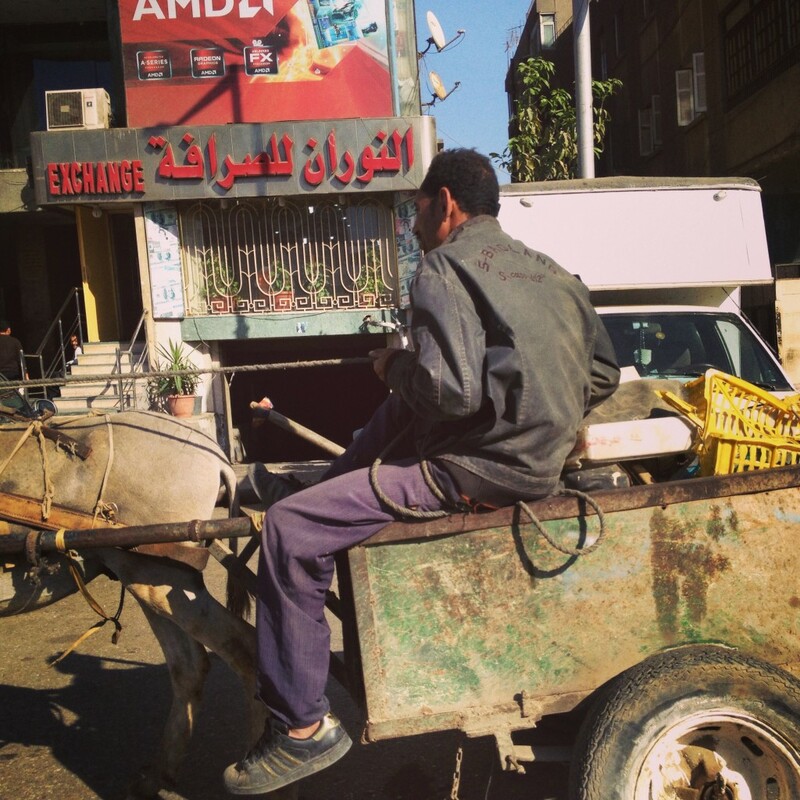 This is the freelance shoe-shine profession in Egypt. Gazmagaya. Zabbaleen: Informal garbage collectors sorting through the massive trash piles for over 9 million people and recycling up to 80% of what the collect. All without a single garbage truck or recycling bin. 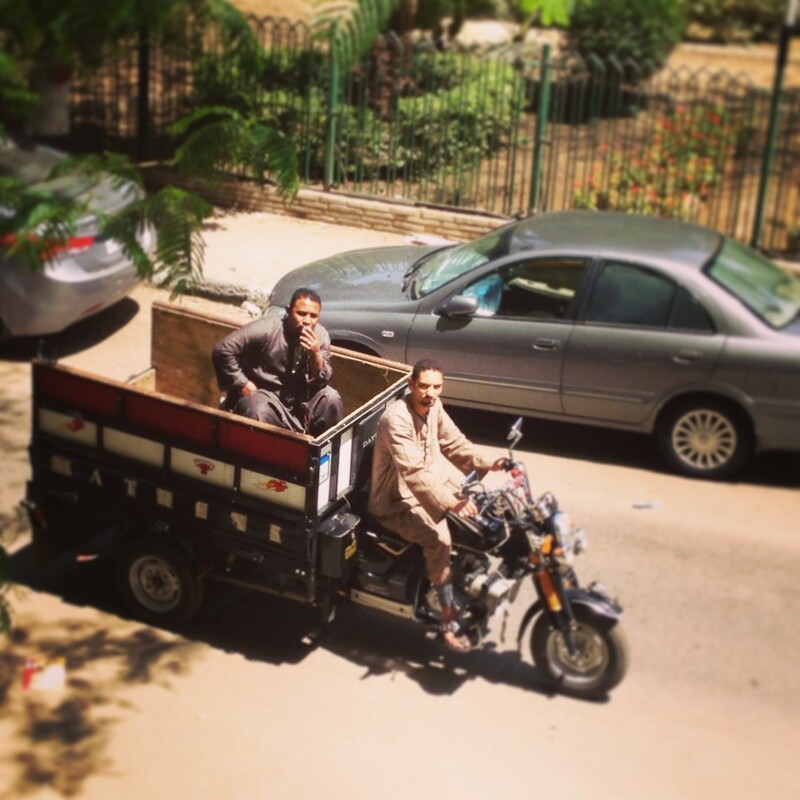 Bikia Guys: Men driving donkey carts through the streets, hollering on megaphones, collecting old, donated furniture, antiques and appliances for resell or upcycle. 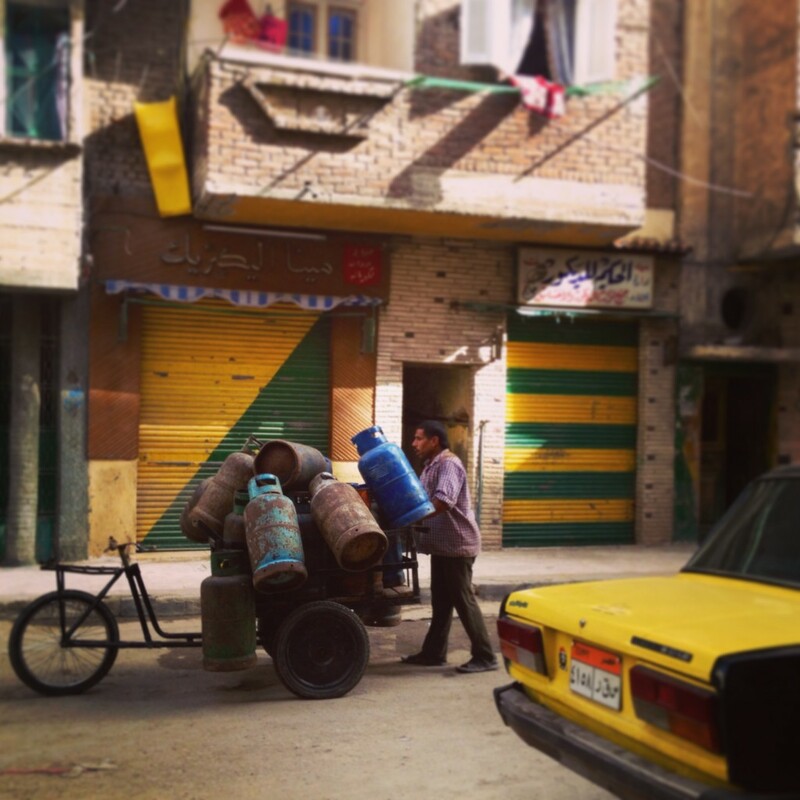 3’raz : People collecting and distributing gas canisters for people’s homes. Tabaya: Without parking meters or open parking lots/garages, the next job is crucial. There are the young men helping drivers find a spot to park, watching people’s cars while they go in to eat dinner, watch a movie, etc., then stopping traffic so that the cars’ owners can back out of the space safely. The cost of this service is unstated, but Tabya are usually given 5LE (72 cents) per car. Tabaya Part 2: Men hanging outside the minibus door, yelling the destination in order to draw customers, collecting the money, and keeping the peace among passengers. 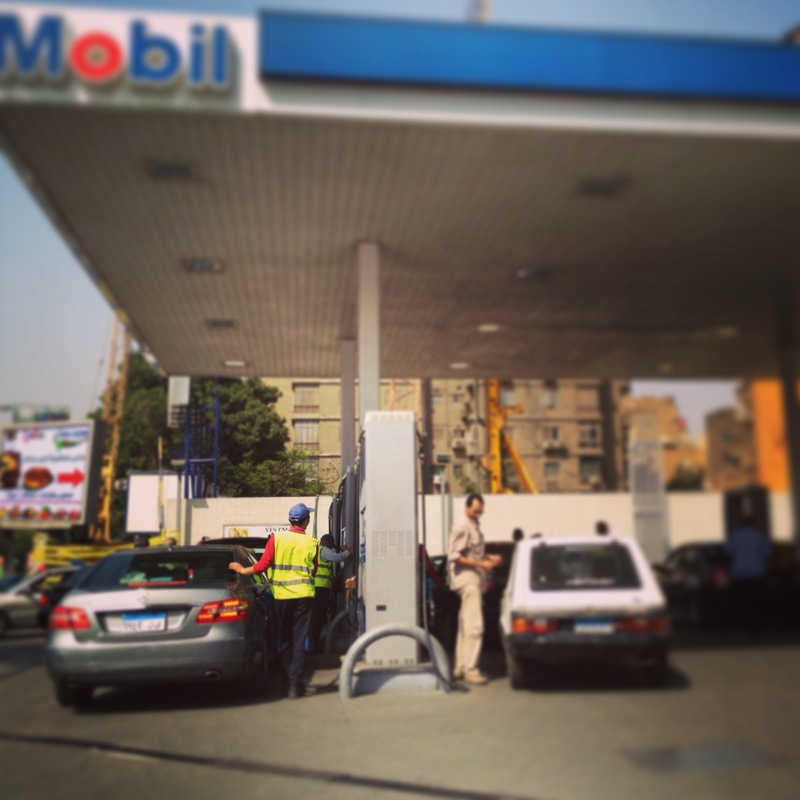 Side note: No one in Cairo ever pumps their own gas. Bawaab: Door guys who also make sure that your car is safe and clean, gates are locked, and no funny business is going on. 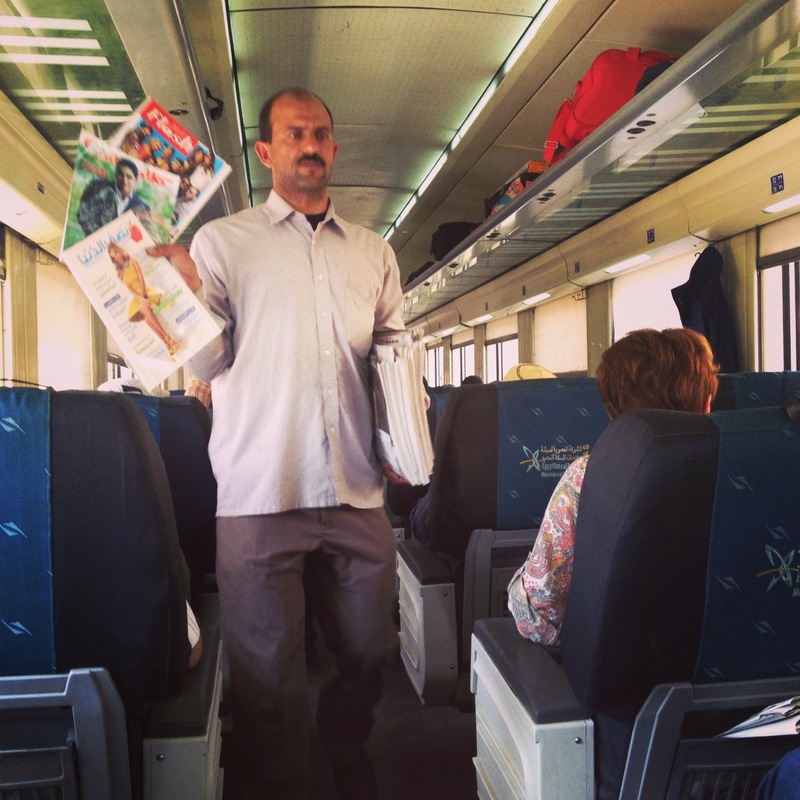 Bay Aya Gawel: Entrepreneurs selling newspapers and sweets on the government trains, Metro, and other venues. There are no dive-thrus that I have seen in Cairo, but there are the women and men selling hot tea and sandwiches on the side of the street. They use real glasses and metal spoons. No disposables. A driver must pull over and take a moment to enjoy their tea. 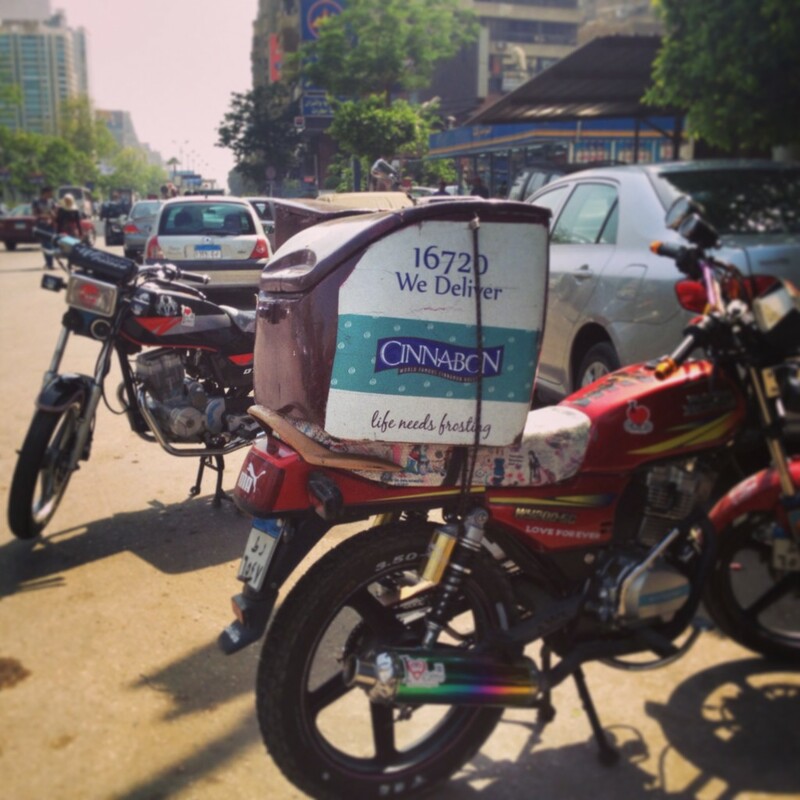 6aYar: Although they officially work for companies and are not independent, I consider motorcycle delivery men some of the heroes of Cairo, bringing you your McDonald’s, groceries, prescriptions, or almost anything you could want, including Cinnabon. Look around you today for the workers that make your city, your school, or your block work. Who are these fine men and women? Around the world, may they all have a beautiful May Day. Power to the people.